The Polish Polar Station of the Institute of Geophysics is located nearby the entrance to the Hornsund fiord (Spitsbergen). It is situated at the northern shore of the fiord, by the Isbjornhamna bay, at a height of about 10 m a.m.s.l. 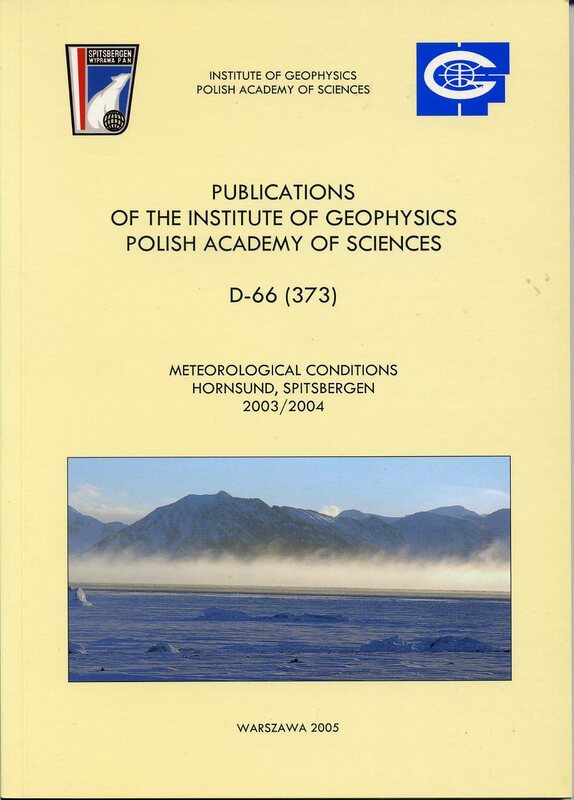 The meteorological measurements and observations at the Polish Polar Station Hornsund had been initiated in 1957, during the International Geophysical Year, and carried out until the fall of 1958. They were resumed in July 1978, when the Polar Station was reactivated, and since then the station has been in incessant operation. The Polish Polar Station (77o00'N, 15o33'E) of the Institute of Geophysics is located nearby the entrance to the Hornsund fiord (Spitsbergen). It is situated at the northern shore of the fiord, by the Isbjornhamna bay, at a height of about 10 m a.m.s.l. The fiord's axis extends, roughly speaking, from east to west. The fiord is appriximately 30 km long, 5-15 km wide, and penetrates the island upto half of its width. It is surrounded by 500-1000 m high mountain chains, and glaciers descending down to the fiord. In the direct vicinity of the station there is Hansbreen(Hans glacier), terminating with a 40-50 m high cliff in the northern part of Isbjornhamna. At a distance of about 2 km of the station there is the ridge Ariekammen (517 m a.m.s.l.) in the NNW direction and the hill Fugelberget (569 m a.m.s.l.) in the NNE direction. The station has open view on the Greenland Sea (towards SW to S) and Hornsund fiord (towards S to SE). The paper gives a brief characterization of weather conditions during the XXVI Polar Expedition to Hornsund, Spitsbergen. The tables contain the monthly mean values of air temperature at a height of 2 m above ground and at the ground level, monthly totals of atmospheric precipitation and sunshine duration, as well as mean monthly velocities and directions of wind. 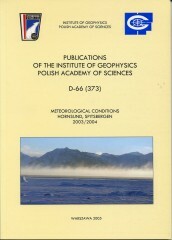 There are also tables listing the total number of days with various meteorological phenomena. The variations of the above-mentioned elements are also shown on diagrams. Air temperature was subject to a typical seasonal pattern: the coldest months were December, January and February, the warmest being July and August. The behaviour of atmospheric precipitation was only slightly different from the many-year average. Precipitation was recorded on 250 days. The snow cover was present through a very long period, a total of 241 days. Author(s): Styszyńska A., Buchert L.
Monitoring of ice in west and central part of Hornsund was initiated during the XXVI Polar Expedition. The observations were selected so as to enable their continuation over next years without a necessity of any major modification. The observations were supplemented by analyses of ice maps issued every 1-3 days by the Norwegian Meteorologisk Institutt for the region of Svalbard. The 2003/2004 ice season in Hornsund was quite different from the average pattern. The sea ice appeared 1.5 month earlier (mid-November) than average (early February, according to Pilot Charts). The waters were free of sea ice as late as August 10, i.e., two months later than usually. The reason for this delay was the presence in the Spitsbergen waters of ice transported from the Barents Sea . In the light of the former analyses, the presence of ice of Barents Sea origin is a normal phenomenon, but the ice content and duration of the ice cover in July are usually smaller. The ice conditions in July 2004 were similar to those in 1994.